Accompanying is the longest love confession, waiting is the deepest miss. This oath was written for love. We often forget about the preciousness of our family when we sigh and chant the sacredness of love. From young to old, mothers use time to prove love as soft as water. Mothers are used to alone while waiting the growth of the children. In the journey away from home, can you slow down and wait them who behind us when they get old? 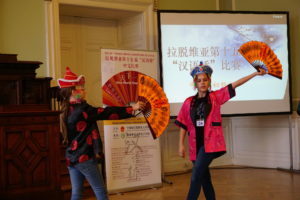 Local time 7:30 pm, there are two little girls who named Nicole (older sister) and Amelie (younger sister) show up quietly in beginner’s class for adult at Confucius Institute at University of Latvia. 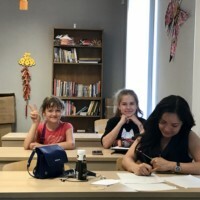 After looking around, they quietly sit behind Alexandra and begin to write Chinese homework. It turned out that they are Alexandra’s daughters who also study at beginner’s class for children at LUCI. They come to wait for their mother to go home together. Because Alexandra’s work related to China, the two little girls have been in contact with China since childhood, what’s more they want to study and work in China in the future. 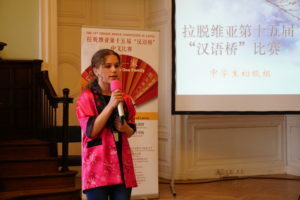 Alexandra is proud when she talks about her daughters because her daughters are better at Chinese learning than she is. She is eager to work hard to learn Chinese together with her daughters in order to achieve their dreams.